With light bullets, awesome accuracy and scorching velocities, this former military round is a great varminter. We need a new centerfire caliber for the small game sporting rifle. It's getting downright boring out there. It doesn't seem possible, but it's been 28 years since Remington introduced that racy little rocket - the .17 caliber Remington. While I was yawning and contemplating this dreary state of affairs, along came James Calhoon. Calhoon is a well-known custom bullet maker from Havre, Mont. who turns out a prodigious variety of .17 and .22 caliber varmint bullets featuring a unique, double HP design and a silver electroplated finish. Calhoon's bullets tend to be very explosive, generate a minimum of bore fouling, and are attractively priced in bulk boxes of 250 and 1000. Casting about for a new challenge, Calhoon reviewed the NATO ammunition test trials of the 1970's in which the British fielded a 4.85mm (.19 caliber) cartridge in competition with the prevailing 5.56mm and 7.62mm rounds already in use. What little he discovered was encouraging enough to go into the .19 caliber bullet business and to introduce two new proprietary cartridges - the 19-223 Calhoon and the .19 Calhoon. 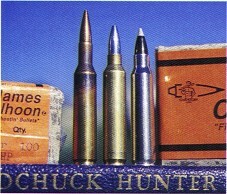 From left, the British 4.85mm military round was the inspirations for Calhoon's .19-223 shown here with the parentcase the .223. In the 1970's, the British armed forces were looking for a cartridge that would be chambered in two new firearms being introduced to replace the 9mm Sterling submachine gun, the 7.62 self-loading rifle and the 7.62 Bren light machine gun. British ordnance felt that the 7.62mm and 5.56mm cartridges had reached the limits of their technological development , so they turned to the 4.85mm or .19 caliber, convinced that its better sectional density and lower recoil impulse would make a superior cartridge to the 5.56. The resulting cartridge proved to be extremely effective. The 4.85mm cartridge was based on a lengthened (49mm) and necked-down 5.56 case drawn with a 23-degree shoulder. The .19 caliber pointed boattail bullet weighed 56 grains. It had a lead core and a copper-washed steel jacket. Velocity from a barrel with a fast 1.5 twist was 3,117 fps. Because of its excellent sectional density, the 4.85mm bullet proved to have superior penetrating qualities when tested against American 5.56 M193 ball ammunition. During the final NATO trials at Meppen, Germany, the 4.85mm bullet at arrange of 550 meters, penetrated a German steel helmet and NATO 3.4mm mild-steel plate. The 5.56 M193 round utterly failed to penetrate the helmet, succeeding only to crack it at 475 meters. The British .19 caliber might have had a future had it not been for FN's introduction of the SS109 5.56mm cartridge during the same NATO trials. The SS109 round, the current NATO standard, featured an improved lead and steel core bullet weighing 62gr. The trials concluded there was only a marginal difference between the 4.85 and the improved 5.56 ammunition, and recommended the 5.56 with the new SS109 bullet be adopted as NATO issue. Calhoon was attracted to the potential of the .19 caliber for the same reasons the British were - high sectional densities, ballistic coefficients comparable to .22 calibers and velocities equaling those of the .220 Swift with lower recoil, less muzzle blast and longer barrel life. The .19-223 Calhoon is nothing less than the .223 case necked-down to .19 caliber, and fire-formed with a 30 degree shoulder. Case preparation is straightforward and simple, and is achieved by the full-length resizing of a .223 case in a Bonanza BR die, and then fire-forming. The second cartridge Calhoon developed around his .19 caliber bullets is the .19 Calhoon, based on the .22 Hornet case. Case preparation is similar to that of the .19-223 , and the result is a sharp looking, improved Hornet case with a 30-degree shoulder. To promote his new caliber, Calhoon has a complete "Re-Barrel Kit" for existing rifles that have a compatible bolt face for either the .22 Hornet or the .223 family of cartridges. The "Re-Barrel Kits" consist of a match grade , stainless or chrome moly,six-groove barrel that has been contoured and chambered but not threaded; a set of Bonanza BR dies; two .19 caliber Dewey bore brushes; and 100 Calhoon bullets in weights of either 32, 36, 40 or 44gr. Since Cooper Firearms in Stevensville, Mont., has begun chambering its fine line of varmint tiles for the Calhoon cartridges, I ordered one of Dan Cooper's stunning model 21 single shot varmint rifles in .19-223 Calhoon. Packaged along with the rifle was a factory 100-yard test target that revealed three test shots grouped together in a slightly enlarged , single hole measuring 1/8", speaking well of the inherent quality of Calhoon's bullets, Cooper's rifles and whoever did the test shooting. The factory test load consited of the 40gr bullet pushed along by 27.5 grs. of H380 - a load that is 0.5gr under the factory stated maximum charge. 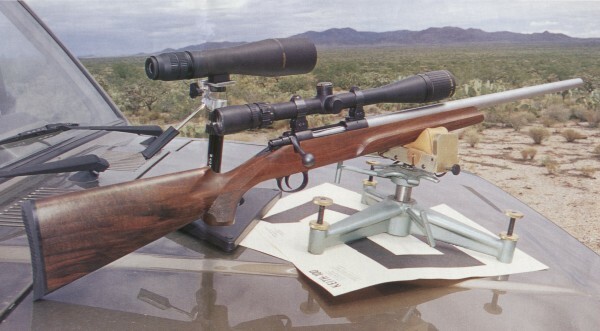 The Cooper Firearms Model 21 Varminter has always been a superbly accurate hunting rifle, chambered in standard calibers as well as in some pretty interesting wildcats like the .17 Squirrel and the .20 Vartarg. The petite, solid bottom, single shot Model 21 action is exceedingly rigid and nicely scaled to the smaller centerfires. Its three lugged bolt rides smoothly in the action and features a plunger ejector, Sako-like extractor, an aesthetic bolt handle that provides plenty of hand clearance. Adding to the accuracy of the Model 21 is its snappy lock time and crisp adjustable trigger. The Model 21 chambered for the .19-223 Calhoon features a medium heavy, free-floated 24" stainless steel barrel measuring 0.800" at the muzzle, and a nicely contoured varmint stock that flares out in the forearm to provide a flat, 2" wide, bag-hugging surface. Weight without a scope runs approximately 7-1/2 to 7-3/4 lbs. Arriving at the same time as the rifle were a set of Bonanza "BR" dies, Dewey brushes, 32 and 40gr. bullets and complete loading data from Calhoon. The powders recommended by Calhoon were all in the medium burning range and included AA 2520, AA 2015BR, BLC-2, IMR 4895, IMR 4320, Varget, Win 748 and H380. Calhoon also suggested I try Vihtavuori high energy N550 as well, since it seemed to provide a very soft and easily-removed fouling. I discovered that N550 did indeed speed-up the cleaning process but did not prove to be the most accurate of powders tested. One interesting sidelight to Calhoon's powder selection was the inclusion of Alliant's Blue Dot with a charge of 14.0 grs. producing 3,340 fps with the 32gr bullet. A number of prairie dog hunters are using light charges of Blue Dot in their .223's, quaintly called "gopher loads", to get the job done on varmints within 200 yards. The benefits are less noise, a cooler barrel and very, very economical shooting. According to Calhoon's loading data, the top velocities that can be obtained safely with his .19 caliber bullets are 4,025 fps with the 32gr., 3840 fps with the 36gr. and 3680 fps with the 40gr. bullet. Arizona really cooks in the summer with temperatures running steadily around the 100 degree mark. High temperatures often generate excessive pressures in the little high intensity cases, so I backed off charges 10 percent and worked from there, focusing initially on the 40gr. bullet. The scope I used for load evaluation was Bausch & Lomb's Brilliant 6-24x mounted in Warne rings and bases. The most accurate powders were AA 2015BR, H380 and Varget. AA 2015 proved not only to be the most accurate, turning in three-shot groups of 1/4" at 100 yards, but also the fastest, averaging 3,536 fps at one grain under Calhoon's maximum charge of 23.2grs. that is listed at 3,660 fps in his literature. Switching to the 32gr bullet, I found that AA2520 was the powder du jour. With a top load of 27.0grs., the .19-223 was racing along at an average velocity of 4,044 fps over the PACT Professional chronograph. Better, yet, three shot groups at 100 yards were hovering at 1/8". It doesn't get any better than that! Cleaning these barrels takes a .17 caliber rod plus 6mm size patches (Bore-Tech .19 caliber rods are now available from Calhoon). The six-groove stainless barrel did not tend to build up excessive fouling, and what bullet fouling was present was quickly handled with a few patches doped with Sweets. And, speaking about .17 caliber equipment, you also need a .17 caliber powder funnel (opened up with a 3/16" drill) to load the small-necked .19-223. If you're like the British and relish the idea of using light bullets with high sectional densities and ballistic coefficients at warp speeds, Calhoon's .19 calibers deliver all the benefits possible. Even if you don't, the .19 calibers are a refreshing change-of-pace, and a development that puts some fire and enthusiasm into your shooting and handloading.